I got it finished! It's designed, it's packed, it's headed to Mesa, Arizona for the Creating Keepsakes show then on to Wendy's store at http://www.licketysplitscrapbooks.com. Mom and I cut, packed and shipped 50 of these little guys today. It's so fun! 10 pages of little boy cuteness! LOTS of precut mats, pages and embellishments!! the Arkansas class group. I've got some fun ideas in mind, now to get them to reality!! The content of this blog is copyrighted. All contests, pictures and products are owned by K.I.S.S. Scrapbooks. Please do not copy any of the material from this site for business or personal use. Hi! I'm Shannon, owner of K.I.S.S. 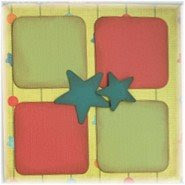 Crop-n-Shop Scrapbook Events. I am a wife of almost 17 years, (Yikes!! ), a mother of a pre-teen son and a five year old daughter. I am a Christian, a daughter, sister, aunt and so many other titles that I adore!! I keep busy planning events for my fellow scrapbookers - from bus trips to one day crops to entire weekends filled with cropping, shopping and classes. I vend at area scrapbook shows, my specialty being embellishents and ribbon. (GOTTA LOVE THAT!!) I love to teach classes at expos, conventions and some in-home groups. I am also a designer and teacher for Lickety Split Scrapbooks. Life is good, I have been blessed!! The content of this blog is copyrighted. All contests, pictures and products are owned by K.I.S.S. Scrapbooks. Please feel free to link to it but please don't scrap lift anything from it.